Thomas M. Kavanagh was born on August 4, 1909, near Carson City, Michigan. He graduated from the University of Detroit with a law degree. In addition to his work with the law, his family was tremendously important to him. Kavanagh married Agnes Miller in 1930 and had four daughters. After earning his law degree, he practiced in Detroit for three years before returning to Carson City. There he served as both City Attorney and City Clerk, as well as engaging in private practice. Kavanagh was twice elected Attorney General, in 1954 and 1956. While serving in that position he established a modern, hard-hitting office and insisted on excellence in the opinions of the Attorney General. As a member of the State Administrative Board, as well as Attorney General, he was a close personal advisor to the Governor. 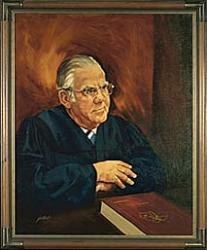 In 1957, Kavanagh was elected to the Michigan Supreme Court and began service in 1958. He was re-elected in 1966. Kavanagh was three times selected by his colleagues to be Chief Justice and served from 1964 to 1966 and 1971 to 1975. He was a hard-driving chief executive seeking to maintain the independent dignity of the judicial branch and to make the Michigan Supreme Court the best in the country. Kavanagh was an excellent lawyer of the old school. He had a close working familiarity with the Michigan Reports and always had the pertinent case ready at hand. Besides his professional life, Kavanagh’s private life was notable. His faith was a beauty to behold. He was constant and rigorous in worship and he loved and supported his church. In addition, his driving personality spilled over into sports. As Attorney General he played on the office’s bowling team and continued to do so even while on the Supreme Court until shortly before his death.